Podiatry Office in Forked River NJ – Ocean County Foot & Ankle Surgical Associates, P.C. Located at 638 Lacey Rd, our Forked River branch is less than ½ a mile west of Main Street in central Forked River. Call us today to schedule your appointment. Ocean County Foot & Ankle Surgical Associates, P.C. of Forked River, NJ is staffed by qualified professionals in the field of surgical and nonsurgical podiatry. Our dedication to patients is second to none, ensuring that each patient receives the customized care they need for their particular foot, ankle or lower leg-related complaint. Whether you require elective surgery for a debilitating condition, or general podiatric care for a common foot issue, you will receive the same level of compassionate podiatric care and treatment. We know what an inconvenience it puts on your life to try and cope with painful or uncomfortable feet. For this reason, we take care to diagnose your condition before recommending a customized treatment plan. Our office includes advanced laboratory facilities and equipment, including an AAA-certified surgical center, certified orthotist, a vascular laboratory and more. Whatever your needs, Ocean County Foot & Ankle Surgical Associates, P.C. NJ can help you ambulate pain free again. 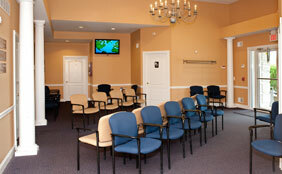 Book an appointment with our Forked River, NJ office today. Nonsurgical treatment for common foot problems. Elective foot and ankle surgery. Treatment of pediatric foot conditions. Diabetic foot care, including our diabetic shoe program and custom bracing. Treatment for traumatic and sports-related injuries of the foot, ankle and lower leg.